The settlement at Torembi consists of three villages, with the oldest village in a forest clearing close to swamps that provide sago for sustenance. Sago flour is traded for fish with their Iatmul neighbours on the river. Each Torembi village has two men's ceremonial houses, one for each moiety. Every ceremonial house displays the totems of the clans represented, while gable masks embody the spirits of the ancestors. 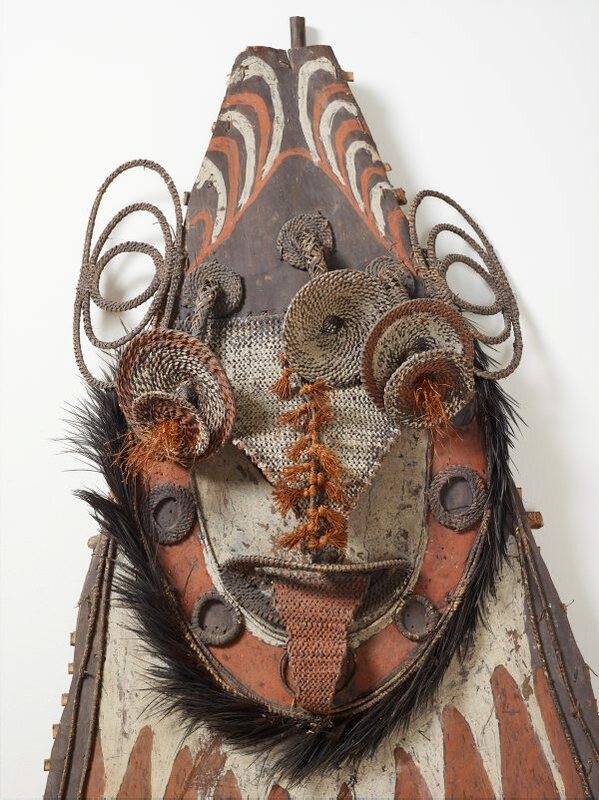 This mask, with its finely woven and protruding eyes, nose and mouth, closely resembles one photographed in situ in 1959 at Torembi by anthropologist Alfred Bühler. It is now in the collection of the MH de Young Memorial Museum in San Francisco. 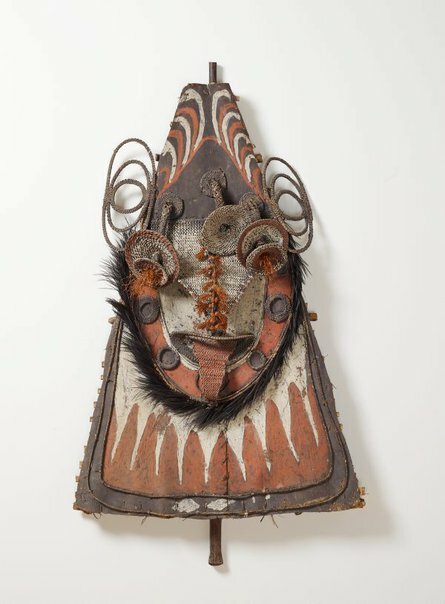 Authority and ornament: art of the Sepik River , Basel, 1985. see cat.no. 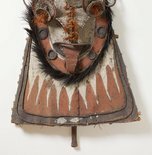 333, 'Gable mask from a men's house' for similar gable mask from Torembi Village in the Middle Sepik. Colour reproduction. Collection of S G Moriarty , Dee Why, 1970, (illus.). This mask can be seen with other objects on page captioned: 'A corner of the Sepik collection featuring, canoe prows, pottery, lime holders etc. ', in the house of Stan Moriarty in Dee Why. Melanesian art , Sydney, 1966, 11. cat.no. 103: "Board in the form of a face. Bark on frame painted light red and white on dark grey ground. Basketry hanging eyes, nose, mouth and tongue, and ears. 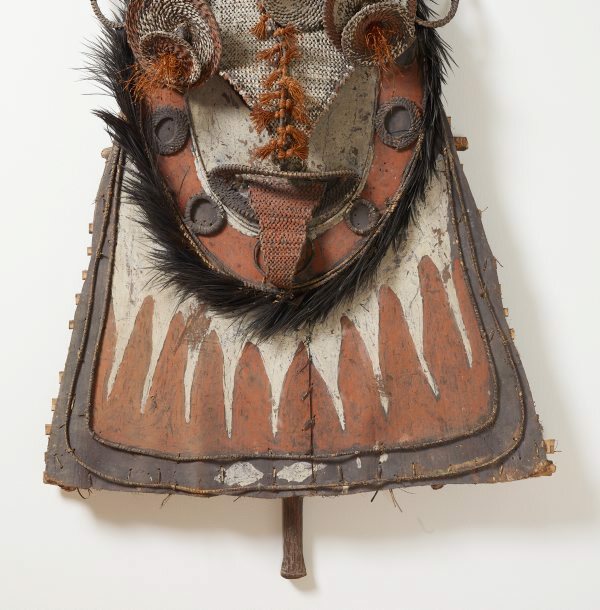 Cassowary feather "beard", 46h x 30w, Sepik River. Coll: S.G. Moriarty. M969".